Marvel’s big summer event Secret Wars began with the destruction of the Marvel Universe, and over the next few months, select Marvel titles will feature “Last Days” crossovers that show how characters deal with the end of the world. The last days of Kamala Khan are chronicled in next week’s Ms. Marvel #16, and in typical fashion for this book, writer G. Willow Wilson is using this big superhero event as a metaphor for Kamala’s current teenage emotional state. Kamala feels like her world is ending after having her heart broken by the duplicitous Kamran, and she’s drowning her sorrows in Doom Dogs from a hot dog vendor tired of hearing about this teenage girl’s romantic woes. 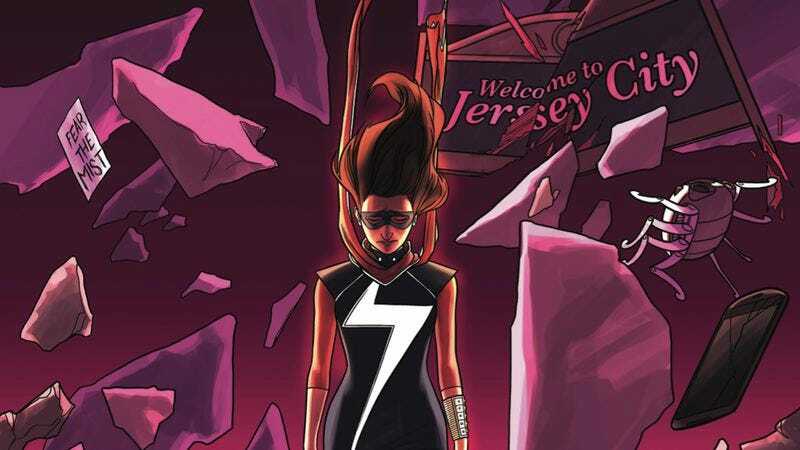 She won’t be able to wallow in despair for much longer, though, because the planet really is about to crumble and she’s the primary protector of Jersey City. This preview of next week’s issue spotlights the focus on character that has made Ms. Marvel one of Marvel’s strongest titles, and the time spent on Kamala’s adolescent identity crisis and relationship woes elevates this book above most superhero fare. Another thing elevating this title is the lush artwork from Adrian Alphona, who returns to the series next week after a three-issue break. Alphona has brought Kamala’s world to life with his detailed design work and expressive characterizations, and Ian Herring’s gentle coloring draws attention to Alphona’s linework while adding dimension and atmosphere. The art team is a huge part of this book’s charm, and hopefully Alphona and Herring will continue with Ms. Marvel for the title’s post-Secret Wars relaunch.